Send me an email sharing how your parents passed on faith &values to you or an approach you've used with your own children. I'll post entries in future updates to encourage each of us to share our faith with the next generation. 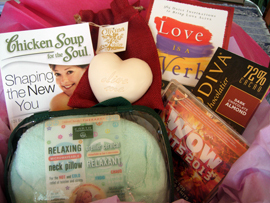 Box contains: Love is a Verb Devotional by Dr. Gary Chapman, Luxurious "Olive-Me" heart-shaped soap by Olivina, Earth Therapeutics Microwaveable neck pillow, Wow Hits 2013 CD, Chicken Soup for the Soul Shaping the New You, and Godiva Dark Chocolate Almond bar! Why not buy a cooking magazine and try something you've never made before, buy a new cookbook, check one out from your local library, or like me, you could revive a favorite recipe from your childhood. "Snowmen fall from heaven ... unassembled." There's no better time to start a journal than the beginning of the New Year. More than two decades of filled journals line a whole bookshelf in my room. Here are some reasons why I keep a journal. inspires me to take steps to make them a reality. perspective of situations and am better able to understand other people's viewpoints. Quote collector - I keep a separate journal to record quotes that inspire and encourage me. In the front pages I write quotes for writers and artists. The second half of the journal contains quotes about the seasons and various topics, presidential quotes, and humorous quotes. During a recent lunch with my 13 year-old granddaughter I discovered she too is a quote collector. Imagine that! Prayers - How much it lifts my soul when I thumb through pages of prayers where I cried to the Lord about a situation and now realize how He answered those heart cries. Navigating grief - Reserved for private thoughts and pain too deep to speak spilled onto page after page. Events & Celebrations - For special times with family and friends, funny happenings, and memories you think you'll never forget. However, you will if you don't write them down. Musings - This may include bits and pieces of my own poetic inspirations often about nature, like backyard birds, beach combing with my husband, or travels. If you want to keep your own journal getting started is easy. Visit your local book store and choose a journal that speaks to your heart. I choose lined undated journals. Dated journals frustrate me because I can't possibly squeeze a whole day's thoughts into the tiny spaces they provide. Some days I write five pages or more, while other days I write two or three pages or only a paragraph. Regardless of the amount, I find keeping a journal fun and rewarding and I hope the same is true for you. Combine above ingredients in a bowl and mix thoroughly. Roll into walnut-sized balls. Heat a tablespoon of oil in a pan and brown meatballs. Transfer meatballs to a 2 qrt. Baking dish. Preheat oven to 350* and make the sauce below. green pepper and pour over meatballs. Cover baking dish and bake at 350* for 45 minutes. Remove cover and bake an additional 15 minutes. on cold winter days when I was growing up. with these thoughts from readers! Bonnie - I find if I am depressed, or unsettled, I write in my journal. Helps me sort out feelings, etc. Then my natural tendency is to hole up, so I'm practicing calling a friend and setting up a date for lunch or coffee. Helps every time. As writers, we tend to be alone a lot. So I practice doing the opposite! Judy - I am one of those who the cloudy weather and dreariness outside affect. I've found thinking and doing for others is the best medicine. Visiting nursing homes, making cinnamon rolls for my Grandkids, sewing for someone, sending a note, whatever lifts them and myself. Another trick is every night I look back over the day for 5 good things and give thanks to God for those blessings. He is so good to us in the beauty and the people around us. Cynthia - I go for a walk let the fresh air revive me, good time to think and reflect on what I have, not what I wished I had. A good cup of tea when I return! Does a soul good! even if it's just over a cup of tea or coffee, can be therapeutic. Burn an invigorating candle like a lemon scent. Lastly, always take it to the Lord in prayer. Linda - To chase away the winter blues or lift my spirits I go outside. I love the cold on my face, and being all bundled up. Most of the time everyone is inside so I have the beauty of the winter all to myself. I also love to classic, skate ski or snowshoe. I am always revived by the beauty of God's creation. Another favorite thing to do is have breakfast in bed (weekends) with a teapot full of tea and music playing in the background while I read. In the evenings tea or hot cider with a good book is always ideal.